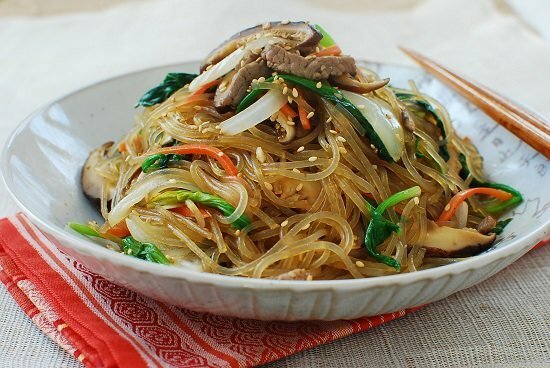 Made with sweet potato starch noodles, dangmyeon, beef and various vegetables, japchae (or chapchae) is a classic Korean dish everyone loves! 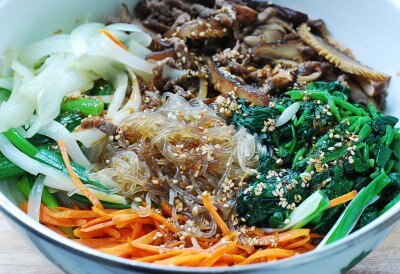 Find out how to make authentic, delicious japchae with this time tested, readers’ favorite recipe! 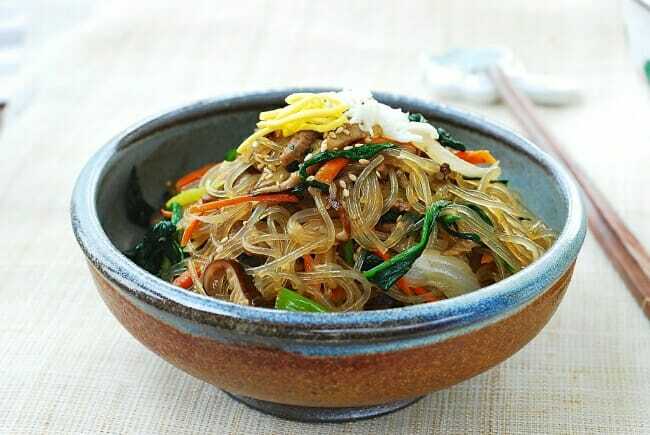 Japchae (잡채) literally means “mixed vegetables.” But the main ingredient of this classic dish is Korean sweet potato starch noodles (dangmyeon), also known as glass noodles. The chewy and springy noodles are nicely paired with thin strips of beef and various vegetables (such as carrots, spinach, onions, shiitake mushrooms, cucumbers, and bell peppers). All ingredients, separately cooked to develop the layers of flavor, are combined at the end into a deliciously colorful dish. 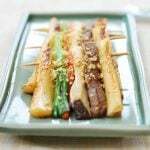 This classic method is what makes this dish special and a Korean favorite for special occasions and traditional holidays. The real secret to successfully creating the authentic flavors of this dish is to find the right balance between soy sauce and sugar. 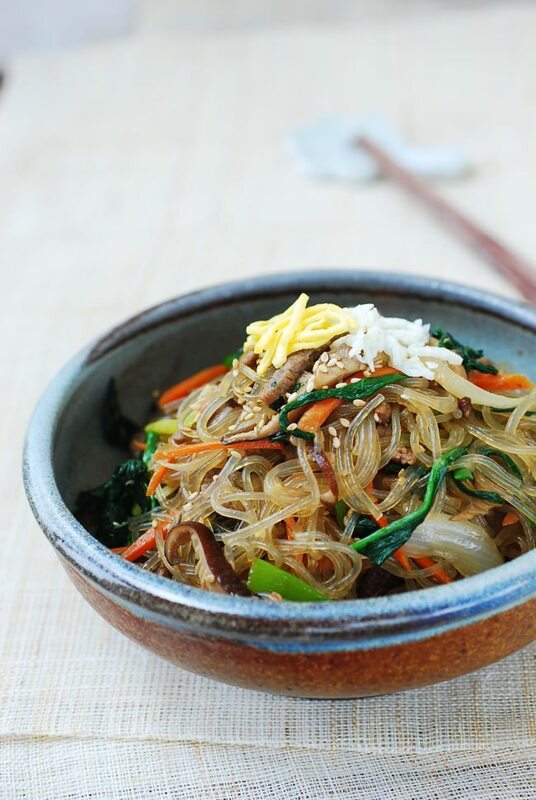 This japchae recipe will give you that right balance! 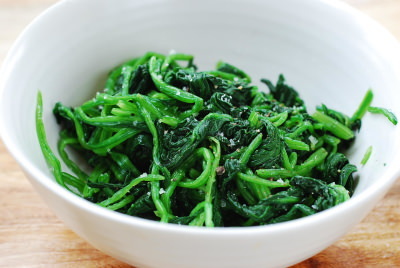 Serve it as a first course or side dish or over a bed of rice to make it a main dish. 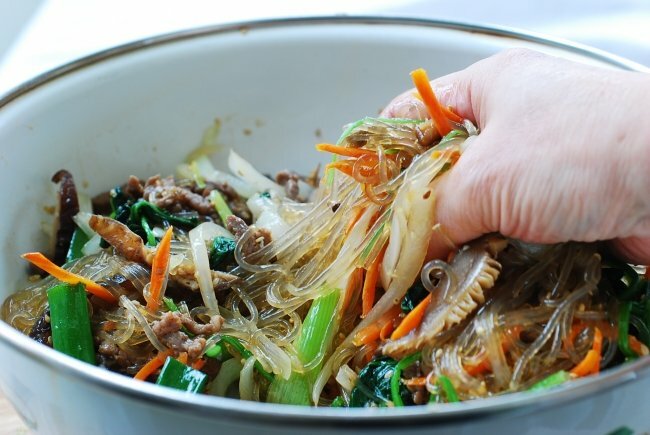 Have you tried this japchae recipe? Please rate the recipe below by either clicking the stars or leaving a comment! And make sure to share your creations by tagging me on Instagram! Stay in touch by following me on Pinterest, Twitter, Facebook, and Instagram. 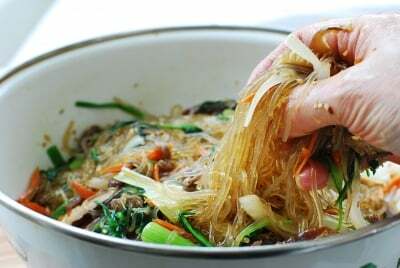 Made with sweet potato starch noodles, dangmyeon, beef and various vegetables, japchae (or chapchae) is a classic Korean dish everyone loves! Find out how to make authentic, delicious japchae with this time tested recipe! Combine all sauce ingredients in a small bowl and mix well until the sugar is dissolved. Cut the carrot into match sticks. Thinly slice the onion. 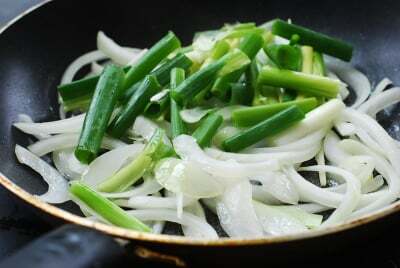 Cut the scallions into similar lengths. 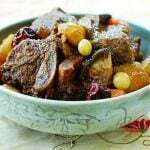 Cut the beef into thin 2-inch long strips and mix with 1 tablespoon of the sauce. Cut the stems off the mushrooms, and slice into 1/4-inch thin strips. Season with 1 tablespoon of the sauce. Blanch the spinach in boiling water only until wilted. Drain quickly and shock in cold water. Squeeze out excess water, cut into about 2-inch lengths, and lightly season with salt and pepper. Bring a pot of water to a boil, and cook the noodles according to the package directions (usually 6 - 7 minutes). Rinse in cold water and drain. Cut the noodles with kitchen shears or a knife into 6 -7 inch lengths. Mix in 2 tablespoons of the prepared sauce in a large bowl. 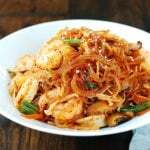 In a large non-stick skillet, stir fry the noodles over medium heat, stirring frequently, until translucent and a bit sticky (about 4 minutes). Transfer back to the bowl. Add 1/2 tablespoon of oil to the pan, and stir fry the onion until translucent over medium high heat, lightly sprinkling with salt and pepper. When the onion is almost done, stir-in the scallion and cook briefly. Transfer to the bowl with the noodles. 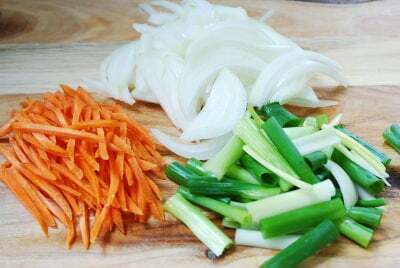 Stir fry the carrot for 1 to 2 minutes until softened. (Do not overcook. 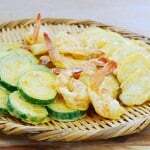 The vegetables should be crisp.) Transfer to the bowl. 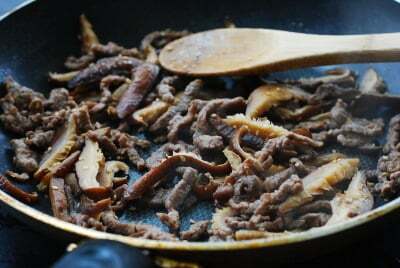 Stir fry the beef and mushrooms together until the meat is cooked through, 2 - 3 minutes. Transfer to the bowl. 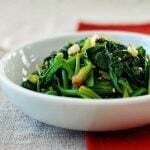 Add the spinach and the remaining sauce to the bowl with all other prepared ingredients. Toss well by hand. Adjust the seasoning to taste by adding a little more (start with 1/2 teaspoon) soy sauce and/or sugar as necessary. 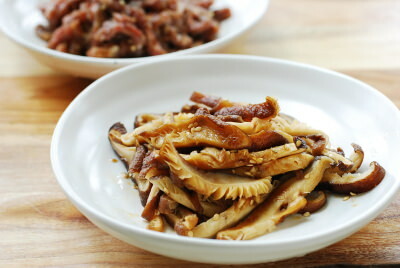 Dried shiitake is ideal for its concentrated flavor and meatier texture, but you can use any kind of fresh/dried mushrooms such as oyster or button mushrooms. Leftover japchae should be kept refrigerated. Japchae reheats well in the microwave. The noodles will get soft and chewy again. I just made this on Saturday and it was SOOO DELICIOUS!!! I didn’t use beef or the shiitake mushrooms (i dont like mushrooms) but it still tasted incredible and I didn’t stop eating until I was 3rd trimester food pregnant! I am so glad to hear you liked it. Thanks for trying my recipe! Made this for dinner tonight – fantastic. Thanks mom! You’re welcome! Happy to hear it turned out well for you. This was so good! Made them for dinner with ingredients I have at home (w/o bell pepper, scallions and added strips of egg omelette). It was so delicious. And you are right about the composition of salt & sugar to make the dish flavourful. Really enjoyed it – thank you for sharing! Thank you, Lisa, for letting me know how it turned out for you! Glad to hear you liked it. It’s great that you made it with whatever you had in your fridge. Japchae is that versatile. Cheers! I just made this on Friday. For more color, I used purple-potato dangmyun. It was pretty:) Aside from my totally over-blanching the spinch(I walked away:/bad idea), everything came out just dandy. Thanks for sharing your recipes with us! Happy to hear that! Thanks for letting me know. I have to try purple dangmyun. I bet it was pretty. I do that (walk away or try to do something else) too sometimes when I blanch something. Happy cooking! Thanks again, Lilluz! Great to hear that. Sounds like you’re implementing quite well as well. 정말 맛있겠습니다. 감사합니다, 페이스북에 공유하겠습니다. made this last night for my family, my youngest ate every tiny bit, and he is not a vegetable fan but he just kept eating… thank you soo much, I have introduced my children to Korean food via your recipes and now we honestly don’t eat much else…..
gam sa hap ni da! That’s awesome! Thank you so much for letting me know. Cheers! I know this is an old post but…I just tried this recipe yesterday and it was amazing. I foresee myself making it very often. Thank you for sharing it! My pleasure, Sarah! I’m very happy to hear it turned out well for you. I’m sure other readers will be inspired to make this dish by your comment. Thanks for letting me know! Hope it turns out well for you. Thanks! Just made this a minute ago and this recipe is a excellent! Thank you so much for posting this. You’re welcome, Nicole! I’m glad it turned out well for you. Thanks for letting me know. I have made this dish numerous times because I loved it that much~ Though I had a few difficult moments in balancing the soy sauce and sugar ( I used Shoyu. It turns out to overpower the sugar and sesame oil) today I got the perfect combination of brands to use and just had to post this comment. I have made this dish numerous times because I loved it that much~ Though I had a few difficult moments in balancing the soy sauce and sugar ( I used Shoyu. 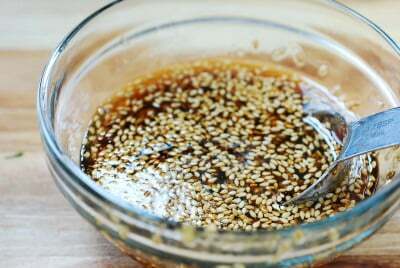 It turns out to overpower the sugar and sesame oil) today I got it down perfect! Great to hear that! Thanks. 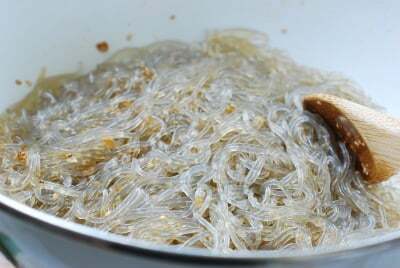 Japchae noodles are made with sweet potato starch, but any starch noodles with the elasticity should be fine. Enjoy! Can I use chicken instead of beef? 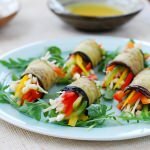 Wow, what a great blog and what great recipes you have! I made this japchae last night and it was delicious! My husband and I couldn’t stop eating it. I’ve been wanting to make japchae for years now and was excited to find your very helpful step-by-step directions. I also appreciated that you included a photo of the dried noodle package. Thank you for making Korean food easy for a Korean-American who is just starting to learn how to make food like my Mom makes! Hi Hyosun! Thank you for posting this delicious recipe. I have prepared Japchae several times…exactly as written :-). My boyfriend asked me to make it spicy. I have never eaten or heard of spicy japchae. Is there a spicy version? Thank you! Not traditional, but you can add some gochugaru (Korean red pepper flakes) in the sauce to make it spicy. Happy cooking! Aww that’s great to hear! You just made my day. Thank you! Love it!! First time I tried cooking this and although took me a while, the result is spot on. Now I don’t need to pay to eat this at a restaurant. Thank you so much. Thank you for the recipe. I made your japchae on the Dec. 23 for dinner for visiting family. They loved it and the leftovers for breakfast. Super easy to follow instructions and your sauce is great. Delicious. Hi! Thank you so much for this recipe! My husband and I love this dish, and used to have to order it from restaurants. Your recipe was the first time I tried making this dish myself and it’s amazing! My husband was actually giggling as he tried his first bite because he thought that it was delicious and he was glad that we don’t have to pay to order this dish anymore. I loved watching him eat it because it made him so happy. When I asked him what he thought of it, he said, “It’s SO GOOD! YUM!” We both LOVE your recipe! Thank you again for sharing it!!! 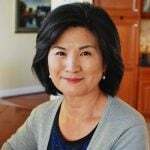 Hi Michelle – So happy to hear you’re making japchae at home and enjoying it with your husband! Thank you very much for letting me know! I made your version of Japchae tonight. It was delicious! I never thought of adding egg before. I did this time and it gave it a better taste. 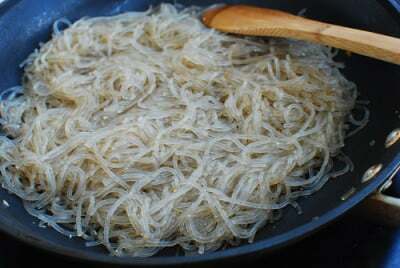 My mom, who was full blooded korean, used to make this dish all of the time but we just called it clear noodles. Lol. Thank you for your recipe. Thank you my husband loved this and between the two of us we finished “6 servings”! I am going to make this tonight. I can’t wait. Delicious!! Great recipe!! Thank you!! Didn’t use beef but still tasted great! Am pregnant and not able to stomach much food, but this went down really well!! Just made your Japchae recipe using watercress instead of spinach. Turned out great! Oh how did I miss your comment! Thank you, Stheph! It’s very nice of you to make Korean food and bring to the office. This recipe is spot on the best. This lady can rock the kitchen with her recipes. Aww thank you, Jerry! You just made my day! Easy to follow directions. I’ve made this recipe 3 times, substituting chicken, and it turned out perfectly delicious! It was a hit with my family as well. Great to hear that! 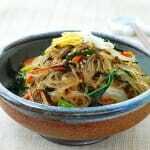 Japchae is so versatile that you can use just about any meat or vegetables. Happy cooking! Thank you! 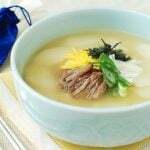 My Korean mother never gave me any recipes and always just made them for us to eat as children. Now that I’ve been an adult for awhile (ha) it’s nice to be able to make Korean meals for her now! 🙂 And my dad appreciates it too! 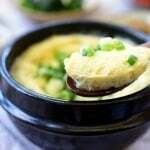 Aww nice you cook Korean foods for your parents. You’re a nice daughter! Happy New Year! Just finished making this for dinner. The whole family LOVED it! and I have very picky eaters (my kids)! It was so delicious! I live in Korea and this definitely tastes authentic! Thank you so much for sharing and translating some of the stuff in English, as I searched for the products at my nearby store, your pictures and explanations helped a ton. God bless! Aww that’s great to hear! How nice you cook at home when you can easily find so much ready made or restaurant foods everywhere in Korea. Your family is lucky. Nothing beats home cooking! Enjoy Korea! Finally, a true Korean Jap Chae recipe. I have searched for 20 years but didn’t know to use the sweet potato noodles. This is truly authentic and you can use any meat that your pallet desires. Thank you! It’s a popular recipe on my website. Enjoy! Honestly like most things I enjoy at restaurants I usually can’t recreate the deliciousness in my own home, but with the recipe I can enjoy Japchae at any time without hurting my wallet!!! I usually eat Japchae at Korean bbq’s, i suddenly had the craving and the closest store near me that sells it was 30 min out. I decided to look online and came upon this recipe and I’m so glad I did!! This recipe is sooo easy I’ve made it twice now and practically know the recipe by heart that’s how easy it is!! I’m so glad you posted this! It’s also very inexpensive to make. I made 3x the amount for the similar price Of the small container I would get at the store. I can now enjoy Korean bbq with all the delicious side in the comfort of my own home. Once again great easy recipe thank you sooo much! Exceptional sauce. Been looking for something like this for years. Thank you for your posting. Such a good dinner! So delicious, an instant hit! A friend made it for me, and I loved it so much I tried making it for another friend. He loved it so much, he made it himself the following week. Awesome dish. Thanks for the recipe! Thank you for this recipe Hyo-sun. This tastes better than the Asian grocery store and just as good as the Korean restaurant ! My husband and I love it. So happy to hear that! Thank you so much for taking the time to write me. It means a lot to me.